System-on-chip or SoC refers to a singular microchip, which packs a variety of necessary components, such as electronic circuits, communication nodes, and other parts of an electronic device. SoCs comprise both hardware and software that are employed in a number of electronic devices such as mobile phones and tablets. Over the past few years, the rising global demand for such mobile computing devices and other miniaturized consumer electronics has led to a significant rise in the use of SoCs. Moreover, the development of technologically advanced SoCs, which has led to inclusion of more features within a specified area of SoC, leading to better resistivity of wires and higher interconnectivity, has further helped in the overall growth of this market globally. The market is expected to exhibit a promising growth rate over the next few years. Transparency Market Research states that the market will expand at a 8.4% CAGR from 2017 to 2025. With this growth rate, the market, which was valued at US$45.89 bn in 2016, is expected to rise to a valuation of US$89.03 bn by 2025. On the basis of application, the report segments the global market for system on chip into telecommunication, consumer electronics, and automotive. In 2016, the consumer electronics segment, followed by the telecommunication segment, formed one of the most lucrative application areas for SoC. The segment, accounting for a significant 37.1% of the global market in 2016, is expected to remain the leading contributor of revenue throughout the forecast period as well. This growth is attributed to the world’s rising appetite for technologically advanced consumer electronics devices such as smart phones, tablets, and wearables. The rising adoption of the IoT (Internet of Things) technology across industrial as well as consumer sectors and the vast advancements in the field of networking services have also helped in broadening the scope of use of SoC in consumer electronics. Moreover, the rising demand for products with low power consumption in addition to being technologically advanced in circuit architecture has further bolstered the demand for SoC in consumer electronics and telecommunications segments. In terms of geography, the SoC market has been segmented in the report into North America, Europe, Asia Pacific (APAC), Middle East & Africa (MEA), and Latin America. On the basis of revenue contribution to the global market, the APAC SoC market dominated in 2016, followed by the North America market. APAC accounted for more than 45% of the global market in the said year and is expected to hold the top spot throughout the forecast period. The region’s market for SoCs has majorly benefitted from the thriving market for consumer electronics, boasting a massive consumer base as well as some of the world’s leading manufacturers of consumer electronics. The increased adoption of IoT-based technological applications across a number of industry verticals has been also been a key reason backing the overall growth of the SoC market in APAC. Over the forecast period, however, North America is expected to emerge as one of the most promising destinations for companies in the SoC market. The report estimates that the North America SoC market will exhibit a 9.2% CAGR from 2017 to 2025, much higher than the rate of growth expected in the Asia Pacific market over the same period, 7.9% CAGR. Some of the leading players operating in the global SoC market are Apple Inc. (The U.S.), Broadcom Limited (Singapore), Infineon Technologies (The U.S.), Intel Corporation (The U.S.), Qualcomm Inc. (The U.S.), Samsung Electronics (South Korea), STMicroelectronics N.V. (Switzerland), Taiwan Semiconductor Manufacturing Co. Ltd. (Taiwan), Toshiba Corporation (Japan), and MediaTek Inc. (Taiwan). 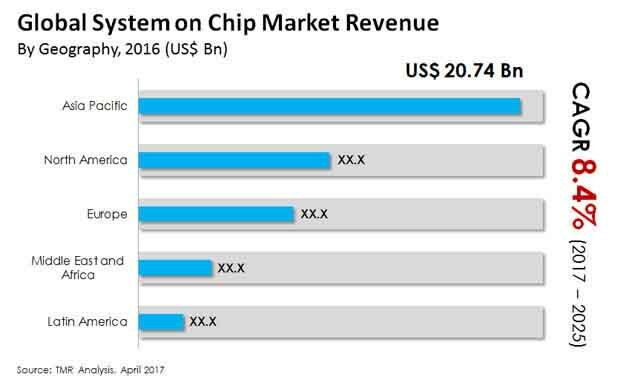 This report provides analysis of the System-on-Chip (SoC) market globally, during the forecast period from 2017 to 2025. The scope of this report includes competitive analysis of various market segments based on the types and applications. Analysis of SoCs with its applications in different industry verticals along with in-depth scrutiny of the SoC market across different geographic segments has also been considered under the scope of this report. A SoC is similar to a central processing unit (CPU) of a computer. However it is much smaller in size and all the components such as microprocessor, memory and peripherals among others are packaged together onto the chip. The components of a SoC vary depending on the device it is to be used in. Generally SoC consists of a graphic processing unit (GPU), microprocessor, timing sources, memory, analog interfaces, peripherals, external interfaces, power management circuits and voltage regulators among others. The small form factor combined with computing power of SoCs has led to its integration into various devices such as smart phones, smart washing machines, tablets, smart air-conditioners, smart television, set-top boxes, industrial automation applications and electrocardiogram telemetry devices among others. Thus SoC contains everything that is present within the motherboard of a computer but consumes much lesser space and power while giving similar or better performance that has resulted in growing applications across different industries. Increasing number of smart electronic devices has been steadily rising over the years. It is seen that the growing number of smartphones, laptops and smart wearable devices has led to the rising demand for SoC globally. In addition to this, technological advancement has also led to inclusion of more features within SoC that has acted as a major driver for this market. Moreover, it is also the growing functionalities within a single IC that has allowed lowering of costs for these SoCs further boosting the market. Cost effectiveness in advanced SoCs does not affect the overall resistivity and capacitance of IC that has also been another important driver for this market. Considering all these drivers there are certain restraints that negatively affects this market. One such restraint being the high costs associated with the application of these SoCs. Another important restraint being the overlapping of functionalities in a SoC that may occur because of fixing all chips within a single substrate. With all these drivers and restraints it is the reduction in the overall cyclical time that is likely to provide huge growth opportunities for this market in the coming years. The global SoC on the basis of different types has been segmented into digital, analog, mixed signal and others. Telecommunication, consumer electronics, automotive and others are the various application segments on the basis of which this market is segmented. Regions that are considered under this report comprises of North America, Asia Pacific, Europe, Middle East, Africa and Latin America. Revenue has been provided in USD billion for this market along with the CAGR for the forecast period of 2017 to 2025. The report also includes competitive profiling of leading players in the industry and their market share to aid in strategic decision making. The market attractiveness analysis along with company market share analysis included in this report provides insight into various market dynamics, industry competition and strategies adopted by market leaders. This report also provides breakdown as well as assessment of various factors impacting the market growth, which includes the drivers, restraints and opportunities. These factors helps in determining various trends and their likely impact on the overall market growth. Post consideration of all these factors affecting the SoC market, this report also includes a holistic analysis and growth estimation of the global SoC market for the forecast period 2017 to 2025. Some of the leading players in the global SoC market are Apple Inc. (The U.S.), Broadcom Limited (Singapore), Infineon Technologies (The U.S.), Intel Corporation (The U.S.), Qualcomm Inc. (The U.S.), Samsung Electronics (South Korea), STMicroelectronics N.V. (Switzerland), Taiwan Semiconductor Manufacturing Co. Ltd. (Taiwan), Toshiba Corporation (Japan) and MediaTek Inc. (Taiwan) among others. The market has been segmented as follows:?